El lunes 18 de abril sonamos en el programa de radio Músicas Imaginadas de Onda Pedriza, con una sorpresita 🙂 Muchas gracias a Ignacio Bahillo por difundir estas músicas y dar publicidad a nuestro próximo concierto en Cerceda. Aura Noctis is a project that for some unknown reason alluded my attention for far too long. All I can say is that after finally tracking down one of their releases I became an almost instant fanatic for their highly unique soundscapes. Olga the creator and driving force behind the project answered some of my queries. What was your musical journey that lead to your interest in and ultimate recording within an underground culture of neoclassical/darkwave music? Neoclassical / Darkwave is surely one of my favourites music genres. I also like very much other styles such as film music, new age, piano solo, and classical music. In general, I like the music that expresses deep feelings, having a special preference for sad music, and I think neoclassical style is in accordance with that. For a brief history was Aura Noctis your first project? Yes, Aura Noctis is my first (and at the moment, only) project. It was set up in 2006. For some years, I was just composing, creating and uploading songs to the internet. 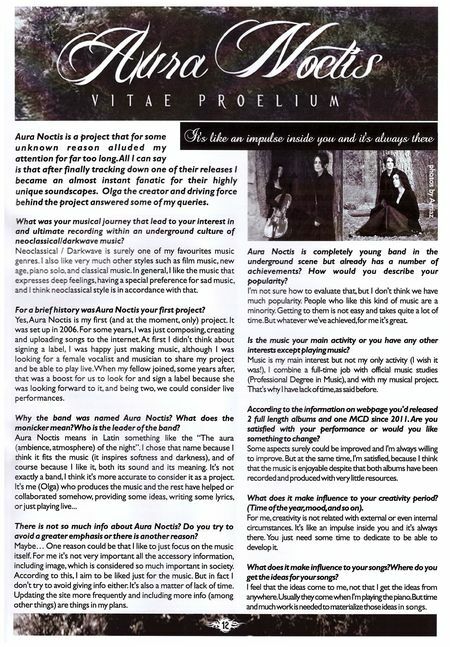 At first I didn’t think about signing a label, I was happy just making music, although I was looking for a female vocalist and musician to share my project and be able to play live. When my fellow joined, some years after, that was a boost for us to look for and sign a label because she was looking forward to it, and being two, we could consider live performances. Why the band was named Aura Noctis? What does the monicker mean? Who is the leader of the band? Aura Noctis means in Latin something like the “The aura (ambience, atmosphere) of the night”. I chose that name because I think it fits the music (it inspires softness and darkness), and of course because I like it, both its sound and its meaning. There is not so much info about Aura Noctis? Do you try to avoid a greater emphasis or there is another reason? Maybe… One reason could be that I like to just focus on the music itself. For me it’s not very important all the accessory information, including image, which is considered so much important in society. According to this, I aim to be liked just for the music. But in fact I don’t try to avoid giving info either. It’s also a matter of lack of time. Updating the site more frequently and including more info (among other things) are things in my plans. Aura Noctis is completely young band in the underground scene but already has a number of achievements? How would you describe your popularity? I’m not sure how to evaluate that, but I don’t think we have much popularity. People who like this kind of music are a minority. Getting to them is not easy and takes quite a lot of time. But whatever we’ve achieved, for me it’s great. Is the music your main activity or you have any other interests except playing music? According to the information on webpage you’d released 2 full length albums and one MCD since 2011. Are you satisfied with your performance or would you like something to change? Some aspects surely could be improved and I’m always willing to improve. 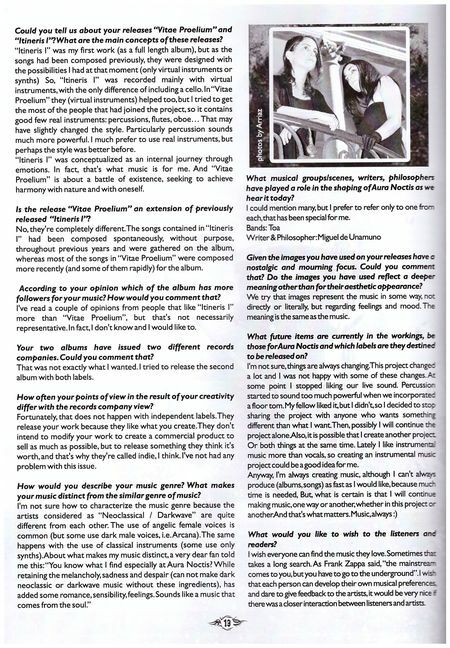 But at the same time, I’m satisfied, because I think that the music is enjoyable despite that both albums have been recorded and produced with very little resources. For me, creativity is not related with external or even internal circumstances. It’s like an impulse inside you and it’s always there. You just need some time to dedicate to be able to develop it. What does it make influence to your songs? Where do you get the ideas for your songs? I feel that the ideas come to me, not that I get the ideas from anywhere. Usually they come when I’m playing the piano. But time and much work is needed to materialize those ideas in songs. Could you tell us about your releases “Vitae Proelium” and “Itineris I”? What are the main concepts of these releases? “Itineris I” was my first work (as a full length album), but as the songs had been composed previously, they were designed with the possibilities I had at that moment (only virtual instruments or synths) So, “Itineris I” was recorded mainly with virtual instruments, with the only difference of including a cello. In “Vitae Proelium” they (virtual instruments) helped too, but I tried to get the most of the people that had joined the project, so it contains good few real instruments: percussions, flutes, oboe… That may have slightly changed the style. Particularly percussion sounds much more powerful. I much prefer to use real instruments, but perhaps the style was better before. Itineris I was conceptualized as an internal journey through emotions. In fact, that’s what music is for me. And Vitae Proelium is about a battle of existence, seeking to achieve harmony with nature and with oneself. Is the release “Vitae Proelium” an extension of previously released “Itineris I”? No, they’re completely different. The songs contained in “Itineris I” had been composed spontaneously, without purpose, throughout previous years and were gathered on the album, whereas most of the songs in “Vitae Proelium” were composed more recently (and some of them rapidly) for the album. According to your opinion which of the album has more followers for your music? How would you comment that? I’ve read a couple of opinions from people that like “Itineris I” more than “Vitae Proelium”, but that’s not necessarily representative. In fact, I don’t know and I would like to. Your two albums have issued two different records companies. Could you comment that? That was not exactly what I wanted. I tried to release the second album with both labels. How often your points of view in the result of your creativity differ with the records company view? Fortunately, that does not happen with independent labels. They release your work because they like what you create. They don’t intend to modify your work to create a commercial product to sell as much as possible, but to release something they think it’s worth, and that’s why they’re called indie, I think. I’ve not had any problem with this issue. How would you describe your music genre? What makes your music distinct from the similar genre of music? What musical groups/scenes, writers, philosophers have played a role in the shaping of Aura Noctis as we hear it today? I could mention many, but I prefer to refer only to one from each, that has been special for me. Given the images you have used on your releases have a nostalgic and mourning focus. Could you comment that? Do the images you have used reflect a deeper meaning other than for their aesthetic appearance? We try that images represent the music in some way, not directly or literally, but regarding feelings and mood. The meaning is the same as the music. What future items are currently in the workings, be those for Aura Noctis and which labels are they destined to be released on? I’m not sure, things are always changing. This project changed a lot and I was not happy with some of these changes. At some point I stopped liking our live sound. Percussion started to sound too much powerful when we incorporated a floor tom. My fellow liked it, but I didn’t, so I decided to stop sharing the project with anyone who wants something different than what I want. Then, possibly I will continue the project alone. Also, it is possible that I create another project. Or both things at the same time. Lately I like instrumental music more than vocals, so creating an instrumental music project could be a good idea for me. What would you like to wish to the listeners and readers? I wish everyone can find the music they love. Sometimes that takes a long search. As Frank Zappa said, “the mainstream comes to you, but you have to go to the underground”. 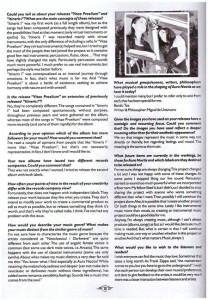 I wish that each person can develop their own musical preferences, and dare to give feedback to the artists, it would be very nice if there was a closer interaction between listeners and artists.